ouch! dislocated my finger! looked a bit like this i think, bit more bent backwards. please don’t puke on your machines! 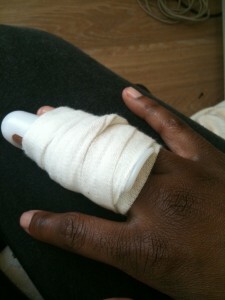 whilst nervously playing too hard in a capoeira batizado i mashed up my middle finger. if i recall correctly an extremely fast Meia lua de compasso knocked it out of place. didn’t realise it was injured till i left the roda. it’s still in bandages, but i’m bored of the splint. hopefully i’ll be able to make a last tour keys playing date. i need to practice!